Markus Renner, Co-Owner and Managing Partner of Branding-Institute and Co-Founder and Co-Chairman of the International Brand & Reputation Community (INBREC) visited South Africa. During his stay he was invited to interviews with several leading South African media. 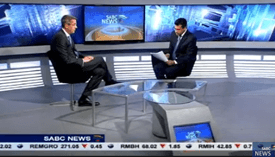 For SABC News, the biggest news channel in the country, he gave an interview on the link between corporate reputation and the business success of companies. He further elaborated on the negative effects on the reputation of Germany as a country and its famous “Made in Germany” attribute in the current VW crisis. Please see the video below. Added to this, Markus was invited to an interview with the radio station SAfm, where he among others talked about the brand and reputation of South Africa on the African continent and worldwide. Please click on the link below to listen to the mp3 file. Markus Renner visited South Africa on the occasion of the foundation of the African chapter of the International Brand & Reputation Community (INBREC) which was hosted by Vuma Reputation Management in Johannesburg. INBREC is a dedicated forum for senior Brand & Reputation managers of successful and highly respected international corporations and organizations. Its country chapters are dedicated forums for senior brand & reputation managers of successful and highly respected corporations and organizations. Participants meet up 2 – 3 times a year to have a high level exchange of their experiences, share their expertise and exclusively learn from peers worldwide. Currently, there are country chapters in Switzerland, Germany, the United Kingdom and lately Africa. New chapters in Finland, Austria and the Benelux states (Belgium, the Netherlands and Luxemburg) are planned to be founded in the next time. Click here to learn more.